During Microsoft's Press Conference at E3 2006, Fable 2 was announced and a trailer released. The sequel to the award-winning Xbox role-play game is now nearing the end of development for the XBOX 360. 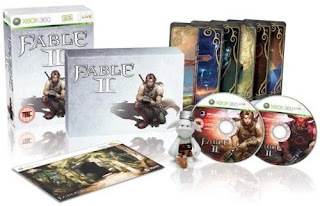 Today, Lionhead Studios published details of a Fable 2: Limited Collectors Edition, including: five Fate cards, a collectible Hobbe figure, a bonus disc with behind-the-scenes making-of videos, a XBOX Live trial card, and additional in-game content.